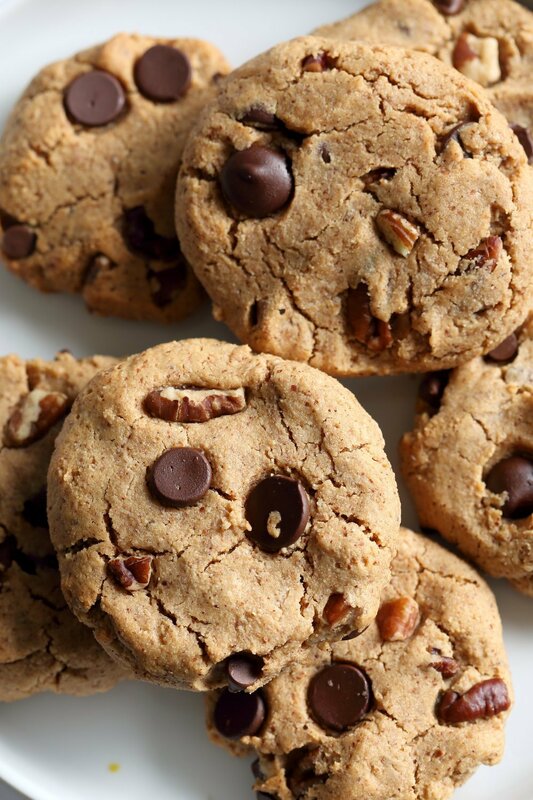 These Fudgy Chocolate Chip Cookies are a perfect snack or treat. Almond Butter and Coconut flour make up the base and use maple syrup for sweetening. Add chocolate chips or other dried fruit, some pecans for a buttery profile and done. Bake less for soft cookies, longer for slightly crispy. Would you believe there is No added oil, no refined sugar (other than some in chocolate chips), no Grain in this cookie! No almond flour too. The cookie texture depends on the nut butter used and generally gets more cookie like after chilling for a bit. Adjust bake times for preferred texture. Just 6 Main ingredients, Easy and Delicious! Lets make these grain free Chocolate Chip Cookies. GF Nut Butter Chocolate Marble Cake! 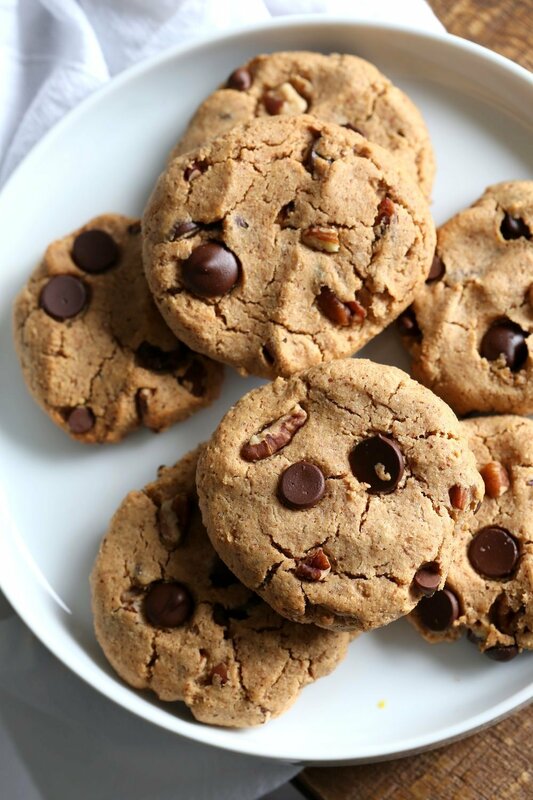 Vegan Paleo Grain free Chocolate Chip Cookies with Coconut flour and Almond Butter. 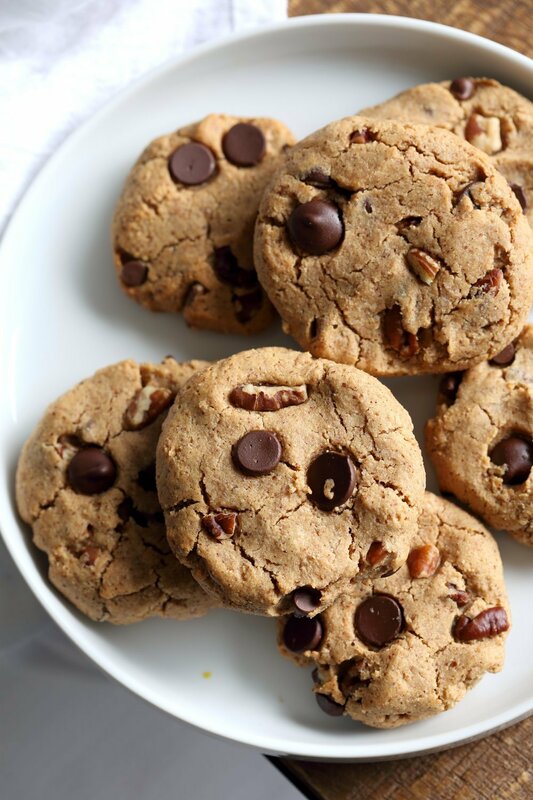 Vegan Paleo Grain free Chocolate Chip Cookies with Coconut flour and Almond Butter. These fudgy cookies are a perfect treat or snack. No refined Oil and No refined Sugar. Vegan Glutenfree Grainfree Recipe. Warm the almond butter and maple syrup in a microwave, or over stove top in a saucepan until warm. Whisk well to combine. You can also just leave it outside for 15 mins to reach room temp then whisk. Add in the non dairy milk, salt, vanilla extract, spices if using. and mix in. Add the coconut flour and baking soda and mix well. Add in the chocolate chips and pecans and mix in. Chill for 15 mins. Bake for 10 mins at 350 degrees F (180 deg C), a minute or so longer for crispier or for larger cookies. 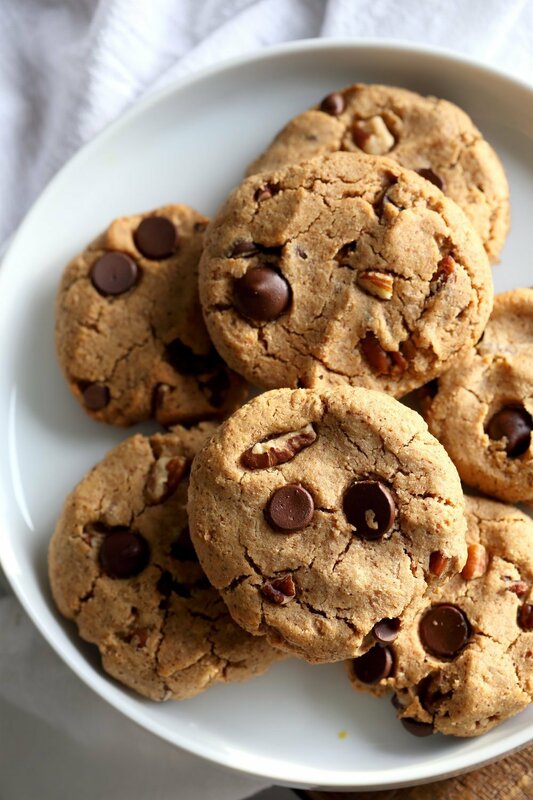 (bake smaller batches to adjust based on your oven, pan, nut butter behavior). The cookies will be soft right out of the oven. Cool on the counter for 15 mins. If they are a bit too soft or muffin like, chill for an hour. Store on the counter for the day or refrigerate for upto a week. Add chopped chocolate chunks, some shredded coconut, other chopped nuts, some oatmeal for variation. Tips: Dont bake these cookies for too long as the coconut flour will tend to burn. Press the shapes discs on the sheet for more compact cookies and refrigerate once cool for the best texture. These look amazing! So, we have to be nut-free in my house (deadly allergies). How do you think soynut butter or another sub would work? i think sunbutter will work. add a tsp lime juice to the batter else the cookie will turn green, edible but funky green with sunbutter. i havent tried soybutter enough to know is direct sub works. if you have used it in baking and it behaves like nut butter, then try it. Can you use almond flour you think? instead of coconut flour or instead of almond butter? These look fab! I’m not aware of any refined sugar free chocolate chips in Australia. Is there a particular brand you’ve used? lilys dark chocolate chips are sweetened with stevia. There might be other dark chip brands as well. What i meant was no added refined sugar in the dough. You can switch the chips out with other things. rice flour will work. you might need a bit more flour. Excellent thank you! And thanks for the quick reply – can’t wait! Perfect timing! Been craving chocolate chip cookies for awhile now! Does the almond butter need to be chunky or creamy? Can we sub walnuts for pecans? Can I sub almond butter for earths best butter? Yes that’s the one earth balance lol but thank you for your prompt reply! 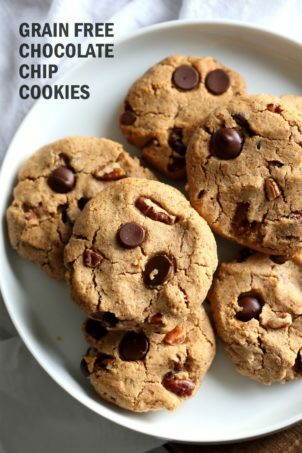 I have already made your classic chocolate chip ones and they were bomb!!! I will be on the search for almond butter today! Can’t wait to try these!!! when you warm the nut butter + maple syrup. The mixture should get drippy and smooth. Mix well so that all the nut butter is evenly changed texture and proceed. Can’t wait to try these! But I don’t have almond butter, do you think it will work with peanut butter, or almond is a must? Thanks in advance! Yes any nut butter will work. PEanut butter is a bit thicker, sp youo might need a bit less coconut flour. also maybe a minute less bake time. check earlier. Oh my gosh, these cookies look heavenly! I love how this recipe is really easy to make. I really want to try making this and adding some rolled oats and almonds for extra crunch! Can I freeze these for a couple days?